It’s finally here! 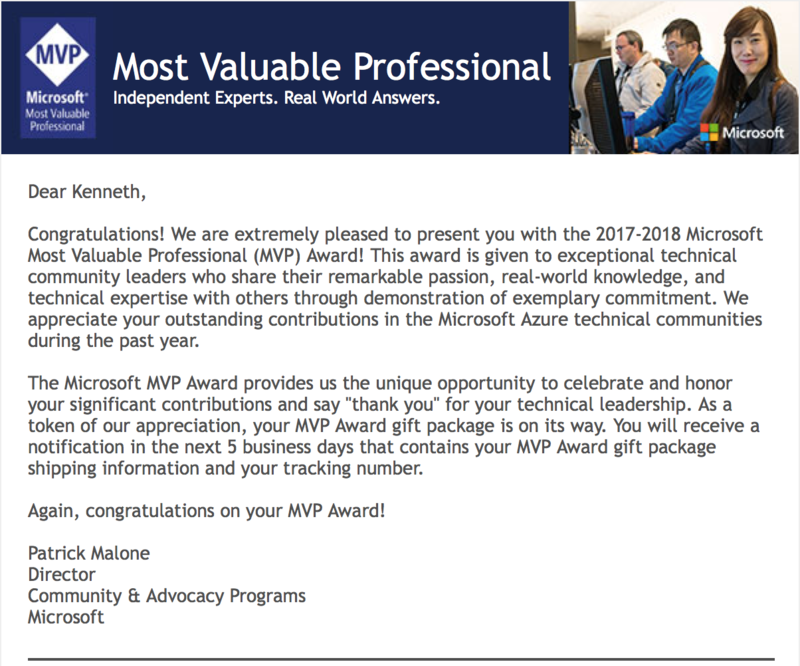 I received an email from Microsoft that I am awarded the prestigious Microsoft Most Valuable Professional (MVP) Award. I was awarded in the area of Microsoft Azure for my expertise, community engagements, as well as business engagements in Azure & AI. I’m really proud that Microsoft recognizes what I do for the community. It has been a long journey with Microsoft. I remembered it all began in 2008, going through a series of interviews before being selected as a Microsoft Student Partner. Similar to MVP, MSP reaches out to students within our campus. Ever since then, I’ve been working on various projects with Microsoft, locally and globally, to evangelize on various technologies and products. Today, marks a new milestone, I’m really excited and honored to be a part of this amazing community. So, what’s next? NDA - Being a MVP, I had to sign an electronic NDA and behavior guidelines which provide MVPs the opportunity to have direct access with Microsoft Product Groups and some behind-the-scenes stuff. Distribution Lists - This is one of the coolest thing after signing the eNDA. It’s getting access to internal distribution lists with lots of fun people, insights and technical discussions on Microsoft products. Being in the midst of some of the brightest minds around the world, it’s one of the best avenues to soak in deep technical discussions and the understanding the thought process / solutions. MSDN Subscription - MVP get MSDN subscription to access a whole range of Microsoft product license and USD$150/month Azure Credits. Office 365 E3 Subscription - MVP get Office 365 E3 subscription, offering cloud-powered connection and control to Microsoft Office applications and tools anywhere across your devices for powerful collaboration. Microsoft Office MVPs receive a 25 seat subscription, whereas for the rest of the MVP receive a 5 seat subscription. These are some of the offerings & benefits of being a MVP! There are lots more which I wouldn’t list especially those like extended Azure credits. I can’t wait for more exciting journey with Microsoft MVP!